The decision to buy your first cello can feel daunting at times. Without experience you won’t know the best cello brands to look for, or what might be the best beginner cello for you. There are a plethora of cello reviews out there, but it’s easy to get overwhelmed by confusing websites. We’ve compiled what we think are the top 10 best cello brands, especially for those who are new to the market. 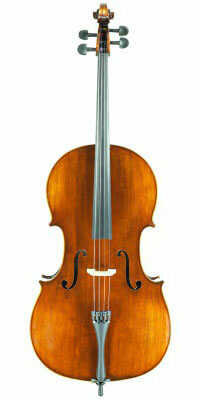 The cello is one of the newer instruments in the violin family, first introduced sometime in the 16th century. Andrea Amati was the first person on record to build them, making them for Charles IX, the King of France. Some consider Amati cellos to be the best cellos in the world. It wasn’t until Bach composed his famous six unaccompanied cello suites in the early 18th century that the instrument really came into the spotlight. The famous violin maker Stradivarius was one of the best cello makers in the world. He created the standard size for the cello, and many of his instruments are still played today. Stradivarius and Amati cellos that have stood the test of time are among the most expensive cellos in the world. Their sound has only improved with age. Many luthiers today model their instruments off these famous ones, attempting to imitate their craftsmanship to produce a similar sounding instrument. There is a lot to consider when you start your hunt for a good cello. The first thing to decide is what you’re willing to spend. How much does a good cello cost? 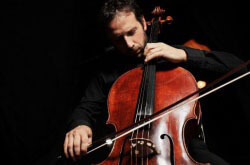 The best professional cello brands can cost upwards of $1 million. Even a cheap cello generally starts at around $1,000, although there are several reputable brands we’ve included that sell instruments for less than that. 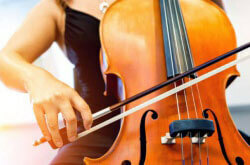 Some of the most expensive cello brands can cost several million dollars. If you’re willing to invest, we recommend looking for something in the $2,000-$5,000 range. If this still seems like a lot of money up front, there are often financing options available. If you’re trying to avoid renting and are determined to save money there are cellos available for as low as $150-$200 that will quickly cost less than even a cheap rental. A cello at that price is never going to be completely handmade, and will be using lower quality materials. If you’re buying a $200 cello and continue with your studies it will eventually hold you back, as cellos that cheap are just not capable of producing the type of sound quality that a more experienced musician requires. Investing a little bit more money in your cello will make playing it an easier, more enjoyable experience. If you aren’t sure about whether you want to continue with cello we recommend going the cheaper route and upgrading when you get serious. Cellos are made in 1/10, 1/8, 1/4, 1/2, 3/4, and 4/4 sizes. Generally, most adults play a 4/4 size. For 4 and 5 year olds the 1/10 size is probably best. Kids ages 5 and 6 typically use a 1/8 cello. The 1/4 size is best for ages 6 and 7. The 1/2 size is generally suited to 8 to 10 year olds, and the 3/4 size is usually for 11 to 13 year olds, although some very small adults might feel more comfortable playing a 3/4. Full size is 4/4. The only way to know for sure which size is best is to follow a sizing chart and take personal measurements. It’s very important that you play a cello that’s the correct size for your body. What makes a good quality cello? There are many types of cellos out there. Cellos are traditionally made with a spruce top and maple sides, back, and neck. Poplar is sometimes used for the back and sides. These are the types of wood you’ll typically find, but very cheap cellos are often made with laminated wood. If possible, avoid laminate cellos. They will never be able to produce the same sound quality as spruce and maple models. How do you know if it’s laminate? Of course, you should ask first, but you can also check through the sound holes on both sides of the bridge. If the wood has layers instead of one single piece, it’s likely laminate. Carbon fiber is growing immensely in popularity. It might sound crazy that a material used to make airplanes and boats can also produce quality instruments, but the company Luis and Clark has been paving the way with these revolutionary new instruments. We wouldn’t recommend carbon fiber for your first instrument, but it produces a shockingly good sound and is extremely durable and light. These are best used for musicians who must play outdoors frequently, because the material is not vulnerable to environmental changes like humidity and temperature. Yo-Yo Ma plays a carbon fiber cello for some outdoor performances – he was apparently confident enough in its sound quality that he strongly considered using it at President Barack Obama’s inauguration, due to the extremely cold January temperatures. Electric cellos are in a class all their own. They will never produce the type of rich sound that a traditional cello can, but they are fantastic for specific needs. It’s not recommended that this be your only cello, but as you get more serious or want to branch out into different music genres an electric cello is perfect. Two of the most reputed electric cello makers are Yamaha and Cecilio. 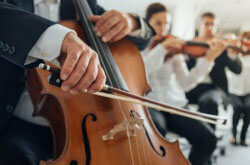 An electric cello can cost as little as $300 up to several thousand. They are incredibly quiet, and can be played connected to headphones so that you don’t disturb roommates or neighbors. If you’re interested in playing in jazz or rock groups the electric cello gives you the type of sound you need. They’re extremely fun to own, and a great addition to your instrument roster once you start advancing. You can’t make a cello purchase without also considering the bow. Your bow is a separate purchase. We could easily write a second guide on bow purchasing alone, but we’ll include some basic important guidelines here as well. First, you shouldn’t purchase a bow until you’ve chosen a cello. Bows respond differently to different instruments, and what might feel like the best bow in the world with one cello could seem lackluster on another. You should consider your bow purchase as equally important to your choice of cello, and budget accordingly. The consensus is that your bow should cost between 20% and 25% of the cost of your cello. This isn’t a strict rule, but it’s a good place to start. Classically, bows are made of wood. The standard is Brazilwood, especially Pernambuco. There are also synthetic options made of fiberglass and carbon fiber. Typically, wood bows are more expensive. Bow prices have an extremely wide range. Generally, the synthetic ones are cheaper. The bow should feel balanced in your hand, and should produce a clear sound from your cello. Play using different techniques and styles to see how it responds. The most important thing is that you shouldn’t feel like you’re forcing the sound from your instrument. Bows come in two different shapes: round and octagonal. Typically you get a warmer tone from round bows. They’re also a bit quieter. Octagonal bows often produce a bigger sound. There is no right or wrong with bow shape, the differently tones and qualities suite different cellos and needs. It’s always best to try out both types. You also need to consider the strings you buy for your cello. Invest in some decent strings to produce the best possible sound from your cello. The best brands include Evah Pirazzi, Larsen, and Thomastik-Infeld. Most cellists use a combination of different brands depending on the string. A popular combination, for example, is a Larsen A, Larsen D, Spirocore Tungsten G, and Spirocore Tungsten C.
However, this is up to you and your budget. Beginner strings can run around $50 while professional quality can reach $300. If you’re playing a lot you should change your strings every 6 months to 1 year. 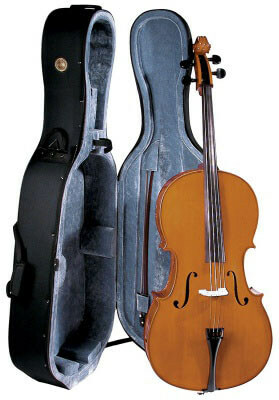 Many of the cello brands recommended below come with a soft case to carry the instrument. For a beginner, the case you keep your cello in might not be at the forefront of your mind. However, the case is absolutely essential for protecting your cello. Soft cases cannot do that job well. A good case can start at around $150-$200 up to $1,000. The Bam France 10001S 4/4 Cello case is one of the best on the market, and retails for about $700 on Amazon. It might seem crazy to spend that much on a case, but if you’re investing in a good cello you need to invest in its protection as well. If you’ve got a very cheap cello the Cushy Hard Body for Cello is only about $200. No matter how good your bow is if you don’t use quality rosin you won’t get any good sound out of it. Rosin is a resin that makes your bow hairs sticky, which creates the necessary friction to get your string to vibrate. If you ever feel like the sound you’re producing is weak, one problem might just be that you need to rosin. There are different types, and cellos usually need a darker, medium-strength rosin to get the best sound. Some of the best brands include Pirastro, Andrea, and Kaplan/D’Addario. Many people researching where to buy a cello want to know if there are certain cello brands to stay away from. Beyond specific brands, the key is finding a good seller. Amazon often has the most competitive prices, but some of their sellers can be unknowns. It’s important to check the reputation of the company you’re buying from. Read the cello reviews and research the sellers! Who makes the best cellos? What is the best cello brand? In reality, it’s totally dependent on the target market and budget range. There are so many good cello brands, and a plethora of student cello reviews. We tried to focus on brands that serve both beginner and intermediate cellists. In the past, European cello brands were considered the best. The most famous cello makers in history came from Europe, and they set the standard. However, Chinese cello makers have begun to produce great cellos, especially good student cellos. American luthiers have also stepped up and have begun making quality instruments. Cecilio is one of the best student cello brands on the market. They’ve developed a reputation for producing instruments of surprising quality for their price range, and because of that they’ve become one of the most famous brands in the world. They set themselves apart by using quality materials as well as providing what is basically a cello starter kit with your purchase. With their beginner models you don’t just get the cello, you get strings, a soft case, rosin, and a bow. Even their cheapest cellos are hand-made, which is not standard in the beginner cello market. You’re going to get the best cello for your money. If you’re looking for a more mid-range instrument or are an advanced player, Cecilio isn’t the best option for you. However, it’s an excellent choice if you’re starting out and want to own your instrument instead of rent. The Cecilio CCO-100 is rather exceptional in its quality for its price point. 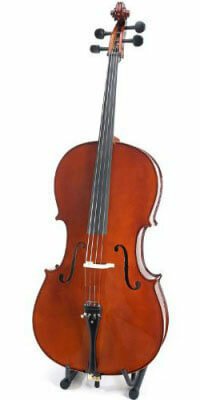 The cello retails for $500 on Cecilio’s website, but can be found for as low as $200. Is it the best cello under $300? Quite possibly. It is one of the best starter cellos available. 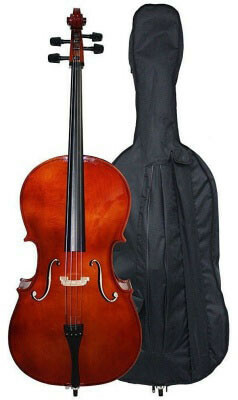 This cello comes with a padded soft carrying case, a Brazilwood bow, rosin, bridge, cello stand, and extra strings. It has a spruce top with maple neck, back, and sides. The Cecilio CCO-500 is a step up from the CC0-100. It features better craftsmanship with a hand carved spruce top and maple neck, back, and sides. Overall, for the price point there isn’t too much to complain about with the Cecilio cellos. They truly set themselves apart at their price range. This cello comes with both a hard case and soft case, as well as the COB-500 Brazilwood octagonal bow, cello stand, extra “high quality” strings, and “quality” rosin. This is a great cello for both beginners and intermediate players, and is one of the best cellos under $500. It’s also one of the best cellos for beginners. If you’re looking for the best affordable cello, Cremona is another one of the best cello brands for beginners. While their instruments’ parts are originally made in China, they are assembled in the United States. 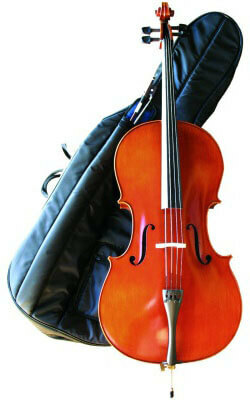 Their student cellos are designed to use quality materials at a low cost. A lightweight hard case is generally included with purchase. The brand has an established reputation as a top manufacturer of student cellos. This cello is made for the beginner/intermediate market. The SC-175 is one of the best cellos under $1,000. 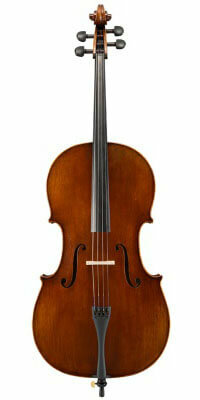 Another entry to Cremona’s student cello line is the SC-165, available for around $800. The SC-165 is one of the best cellos for high school students. D Z Strad produces excellent cellos that go beyond beginner quality. They’re one of the top cello brands for intermediate players. They make instruments that go up into the thousands, and are known for their incredible quality. They set themselves apart with their traditional methods, using Italian tonewoods that they dry outside for 20 years, followed by time spent in a special drying room that ensures the stability of their woods. Their higher end cellos are an excellent investment that you can keep for your entire playing career. Their instruments are a bit more of a commitment, but if you’re getting serious about cello they are an excellent choice. They’re perfect for intermediate players who see themselves continuing with music. This is a fantastic cello for any intermediate player, or a beginner who wants an instrument that produces great sound and is easy to play. It’s got a spruce top with mahogany back and sides. The fingerboard and fittings are ebony. It’s a little pricier than some of the absolute beginner cellos, and is available for about $1,200. This includes a soft case, bow, strings, and rosin. The D Z Strad Cello Model 101 is one of the best cellos under $2,000. The 150 is one step up from the 101 in the D Z Strad student line. Advertised as being “handmade by prize winning luthiers” the attention to detail is noticeable. It’s a beautiful instrument. 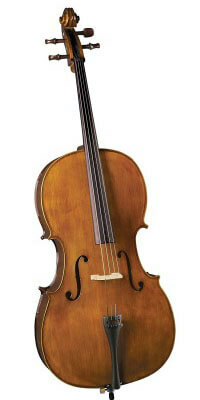 The D Z Strad Cello Model 150 a great option for the intermediate to advanced player. It is completely handmade, hand oil-varnished, with hand-carved pegs and ebony fingerboard and fittings. The cello comes with a soft case, bow, and rosin. Merano have developed a great reputation for producing affordable, quality instruments. Their brand focuses on student models, and are especially popular with schools. Their cellos are available in traditional wood tones, as well as a range of fun colors that would appeal to young players. They aren’t the best quality instruments in this guide, but they include everything you need for a very low price. They’re one of the most accessible instruments available, and would quickly save you money over renting. Their lowest-end instruments have “ebonized” fingerboards and pegs, and we don’t recommend them. They are so affordable that their top line cellos are still very cheap. They make a good starter cello. The MC400 is a beginner’s cello that has one of the lowest prices on the market for an instrument that features relatively quality materials. Available for about $300, you get an extra set of strings, cello stand, music stand, tuner and metronome, mute, bag, and bow included in that price. The cello is made with a spruce top and maple back, neck, and sides. The fingerboard and pegs are ebony. You’d expect a cello this cheap to only include laminated wood and brushed hardwood, and it’s impressive that Merano is able to balance better quality with price. 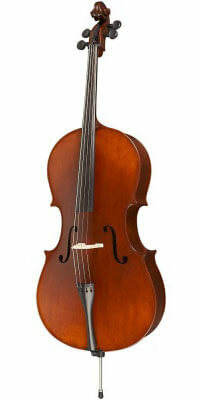 The CL500 is the best cello in the Merano line, and retails for around $450. It features a spruce top and maple neck, back, and sides. It’s a simple cello, but fulfills all the basic requirements for a decent starter instrument. It features a real ebony fingerboard, pegs, and tailpiece. A bow is included, as well as soft case and rosin. It’s one of the best cheap cellos. Crescent started in 2001 in Southern California and is now one of the most popular beginner cello brands available online. All their instruments come with a case, rosin, cello stand, extra strings, and bridge. The Crescent Beginner Cello Starter kit might be one of the cheapest kits available. It comes with everything: bag, bow, rosin, stand, and strings. It is not the greatest quality, and only features “ebonized” pegs and fingerboard. It’s saving grace is its $170 price tag. This is a cello we’d only recommend if you’re determined to save money over renting. Yamaha is a massive Japanese company that produces instruments, electronics, and sports equipment. They are probably the most recognizable instrument brand to any kid that’s played in a school band or orchestra, and everyone knows their iconic tuning fork logo. They have a long and storied history and are the single biggest manufacturer of musical instruments in the world. Yamaha is most famous for their electric cellos, and we thought we’d include them on this list for those interested in non-traditional instruments. 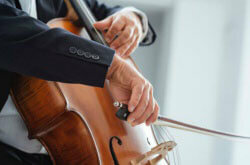 If you’re buying your first cello, stick with a classical instrument. If you’re looking to expand out or start doing recording projects an electric cello is a great addition to your collection. The SVC-110SK stands out because it provides the closest to a classical performing electric instrument, with a body made of spruce and maple neck and bridge. Its fingerboard is made of ebony. It comes with a soft case, headphones, auxiliary cable, chest support, and batteries. The biggest sell with this cello is that you don’t make any sound to those listening around you, and the included headphones make it easy to practice in crowded places or with roommates without disturbing anyone. The SVC50 is one of the lightest electric cellos available, which makes it great for on-the-go musicians. The whole cello can be broken down for carrying. D’Luca makes a wide range of instruments, and they offer something for beginners up to serious, advanced players. They’re a company that inspires brand loyalty, and many players who start out on their student cellos end up upgrading to their more advanced models as they improve. The MC100 features a maple back, neck, side, and bride. The package is inclusive, and ships with a stand, soft case, strings, tuner, bow, and rosin. It’s one of the most affordable cellos available. For the price it produces a great sound quality, and the kit has everything a new cellist could need. D’Luca produced the Meister Handmade Ebony Fitted Cello as a slightly higher-end beginner cello, featuring handmade craftsmanship and ebony fittings. The included bow is rosewood. This is not a full starter kit, and accessories will need to be bought separately. It includes the basics: strings, bridge, bow, and soft case. Knilling has been making instruments since 1922, and since that time has developed an extremely trusted reputation. They are an innovative company, developing Perfection Pegs, that look like traditional pegs but have inner gears that make tuning easier and far less temperamental regardless of the weather. Their cellos are also customizable. The Knilling Bucharest cello is a truly high quality beginner cello, and is suitable for intermediate players as well. It retails for around $1,600 and features a spruce top and maple back and sides. The fingerboard, nut, and tailpiece are all made with real ebony. It includes the Perfection Pegs that have built a reputation for making tuning a stress-free experience no matter the environmental conditions. A bow is included. The Maestro is made with a spruce top and maple sides with ebony fittings. The Maestro sets itself apart with a lovely flamed back that makes it appear higher-end. Although the Maestro is made in China it is inspected in Germany or the US before being sold. The included carbon fiber bow is by J Remy. Eastman Strings was founded in 1992 and has quickly built up a reputation as one of the premiere workshops in the world. Eastman was founded by a Qian Ni, a flautist based in Beijing who was committed to creating quality instruments. Eventually, Eastman also opened a bow making workshop as well. Eastman is beloved by novices and professionals alike, and has an extremely wide range of cellos across several price points. An Eastman cello is a fantastic investment, and their instruments will last a lifetime. Eastman is one of the best cello brands for intermediate players. The VC305 is marketed towards players who aren’t absolute beginners, and doesn’t come with any extras. If you’re willing to invest in a cello in the $2,000+ price range you should buy your bow separately and make sure it’s the perfect fit for your cello. For intermediate players the VC305 is a great choice, and will suite your needs as you advance. This is at the top end of intermediate, and excellent for advanced players as well. The Ivan Dunov Superior Model 402 retails for around $4,000 and does not skimp on quality craftsmanship and materials. It’s crafted in Romania and finished in the United States, with a spruce top and maple back, ribs, sides, and scroll. The fingerboard and pegs are ebony. Depending on where you purchase it some websites include a bow and hard case, while others include only a soft case and no bow. 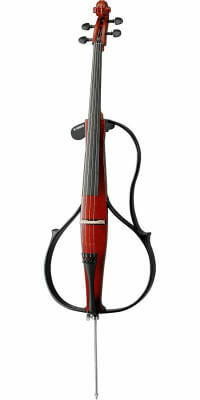 We recommend buying this cello separately from the bow and trying out several different ones with your new cello. The Ivan Dunov is one of the best cellos for advanced students. It’s also one of the best cellos for under $5,000. 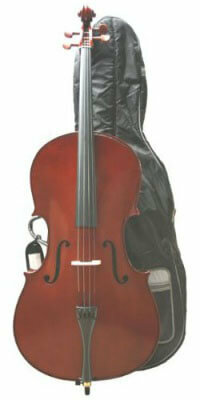 Primavera cellos are another popular entry level line that are good for those just starting out. They’ve developed a solid reputation for beginning players who want to buy instead of rent. Their materials are generally of pretty good quality – using spruce and maple as well as real ebony. The Primavera Prima 90 is marketed specifically for new players, offering quality materials at a very low price. It features a spruce top and maple sides, as well as rosewood pegs. A bow is included, as well as a soft case and rosin. The Prima 200 is one of the best-selling beginner cellos on the market because of its quality to price ratio. While not the cheapest beginner cello out there, it perfectly balances affordability with a genuine attention to excellent craftsmanship. It’s made with hand carved spruce and maple, as well as ebony fingerboard and pegs. In addition to the cello, a soft case, strings, and a bow are included. In the end, this guide is just meant to give an overview of what you need to look for when buying a cello, especially as a beginner. You might still be wondering, what cello should I buy? The absolute best thing you can do is play the cello before you buy it, and try more than one. If you are completely new to the instrument, see if you can bring your teacher or get their advice as well. It’s difficult to know how to buy a good cello without experience. If you don’t know where to buy a cello, look up local shops as well as online retailers like Amazon. Cellos are a serious investment, and a lot more goes in to making a cello sound its best than the instrument alone. It’s worthwhile to buy instead of rent if you are even remotely committed to playing, and the moment you upgrade to an instrument made with quality wood and real ebony your entire playing experience will improve drastically. 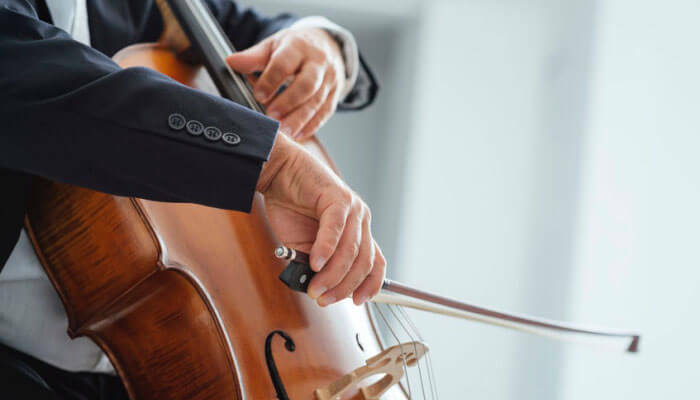 It’s not a requirement to break the bank on a new cello, but by focusing on the details and buying good accessories you’ll wind up with an instrument that suits your needs at any price point.